TALLAHASSEE, FL. 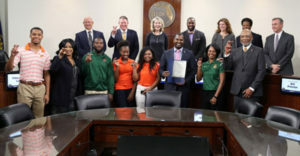 – The Florida A&M Department of Athletics received a proclamation from the Leon County Com-mission during its meeting on January 22 for their humanitarian efforts in the aftermath of Hurricane Michael. FAMU Tennis Coach Nikki Goldthreate, Head Football Coach Willie Simmons and Athletics Director John Eason, Ph.D., were all present for the ceremony. Football players Dock Luckie and Terry Jefferson, along with tennis players Sophia Osabuohien and Mialiniania Rakotondrazafy also represented the department. Leon County Commissioner Nick Maddox initiated the recognition as part of a day of the Commission celebrating athletic achievements. The presentation began with the playing of the “FAMU Cares” video produced by Rattler Productions chronicling some of the outreach efforts undertaken by the department to support those in need after the near category five hurricane ravaged the northwest landscape of Florida. The central theme of the effort was an announcement by Simmons at the conclusion of their football game in North Carolina, which took place 72 hours after the hurricane had made landfall. The Rattlers had just defeated the number one Mid-eastern Athletic Conference team in the country, but the celebration was short-lived as the scene back home took precedence in the emotions of all involved. State Representative Ramon Alexander (D-Tallahassee) connected FAMU Athletics with the Salvation Army and the U.S. National Guard. Most of the efforts of the Department of Athletics were under this umbrella. From delivering water to Marianna to assisting the National Guard in Chattahoochee, most of FAMU’s three hundred student-athletes got involved. One of the most involved days in the re-covery effort was a trip to Chattahoochee. Long after many had power and resources restored, Chattahoochee was still struggling. The Rattler football team took on a three-hour shift, relieving National Guard soldiers who had no relief in sight. With the vast area the storm covered, personnel were stretched thin. In Chattahoochee, the troops did not have anyone to relieve them. When the football team arrived, they were a sight for sore eyes. The unit was able to take a three-hour break while football players handled the rationing of food and water supplies to those affected by the storm. 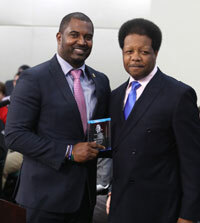 In a total surprise, Commissioner Bill Proctor presented Simmons with an award unrelated to the Leon County Commission. Proctor presented the Southern Christian Leadership Conference (SCLC) Martin Luther King Jr. Service Award for Simmons’ leadership in community service this year.